# Declaration of peace, and forgetfulness of past problems. # Confirmation of old treaties between the two nations. # British crown to retain Newfoundland and adjacent islands, except Saint Pierre and Miquelon. # French crown surrenders fishing rights between Cape Bonavista and Cape St. John (on the east coast of Newfoundland); but instead keeps fishing rights between Cape St. John and Cape Ray (round the west coast of Newfoundland). # The French may still fish in the Gulf of St. Lawrence. # In the West Indies, British crown returns Saint Lucia to France and also surrenders Tobago, subject to guarantees of the rights of British settlers in both islands. # French crown returns Grenada, St. Vincent, Dominica, St. Christopher’s (St. Kitts), Nevis and Montserrat to Britain, subject to guarantees of the right of French settlers in any of those islands. # In Africa, British crown surrenders the Senegal river area to France, and returns to France the island of Gorée. # French crown guarantees to British crown possession of the Gambia river area and Fort James. # British shall have right to carry on the gum trade from the mouth of the River St. John to Portendic Bay, but may not establish permanent settlements there (boundaries of the various African possessions to be determined by commissioners to be chosen within 3 months of ratification). # British and French access to other parts of the African coast to continue as customary. # In India, British crown returns to France all settlements on the Orissa coast and in Bengal, as at the beginning of the war—with liberty for the French to make a ditch round Chandannagar (for drainage)—and will as far as possible provide security for French trade in the area. # The British crown also delivers Pondicherry and Karikal to France, with additions to the former at Valanour and Bahour, and the latter absorbing the four Magans bordering on it. # Mahé and the factory at Surat also returned to French control, with security provisions as in Article 13. # Britain and France will cease to aid their respective Indian allies against each other within four months (ceasefire orders having already been sent to British and French forces in India). # British crown abandons restrictions on French use of the port of Dunkirk in France. # The two crowns will make new commercial agreements by the end of 1786. # All territories conquered by either side since the war began, and not mentioned above, are to be returned to their pre-war owners. # The two nations should be able to enter into their respective possessions of St. Pierre & Miquelon, St. Lucia, Gorée, Grenada, the Grenadines, St. Vincent, Dominica, St. Christopher, Nevis & Montserrat, within three months of ratification of the treaty. For Indian towns etc., within 6 months. # to 24. Technical details. * Compare Article 5 with the provision for fishing rights in the treaty with the United States. This was one of the main stumbling-blocks in the peace negotiations, as the two allies both wanted the same thing. 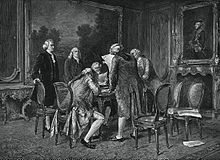 * Note that several Articles relate to return of territories, not to surrender; for the most part this treaty simply restored the territorial situation which existed before France entered the war, a bitter disappointment which contributed to the outbreak of the French Revolution a few years later. # Exchange of prisoners and hostages to take place within 6 weeks of ratification; also ships (naval and merchant) captured after hostilities at sea officially cease are to be returned. # British crown surrenders Minorca to Spain. # British crown surrenders East Florida and West Florida to Spain—British inhabitants have 18 months from the date of ratification to leave (this may be extended if they are unable to arrange sale of their possessions within that time). # In “the Spanish continent” [the majority of America south of the United States] British subjects will be permitted to cut and carry away logwood in the district between the Bellize (or Wallis) river and the Rio Hondo (both of which shall be open to navigators from both nations) up to an isthmus formed by a widening of the Bellize river and a widening of the Rio Nuevo (New River), from where the boundary goes straight across the isthmus to the Rio Nuevo, along the Rio Nuevo to where it comes opposite a river [marked on an accompanying map] which flows into the Rio Hondo; then across to that river, downstream to the Rio Hondo, and finally down the Rio Hondo to the sea. Commissioners will mark out places where the British may establish settlements, and all British subjects within the Spanish continent and offshore islands will move to those settlements within 18 months from ratification (with full assistance from the Spanish authorities). No fortifications may be made within this area, and any now existing must be demolished. The British settlers may also fish for their subsistence off the coast of the designated area, and neighbouring islands (but must not make any other use of the said islands). # Spanish crown returns the islands of Providence and the Bahamas to Britain (with similar provisions to Article 5). # The two nations should be able to enter into their respective possessions of East Florida, Providence and the Bahamas within three months of ratification of the treaty, sooner if possible. # to 12. Technical details. * In the short term, Spain probably did better out of the American Revolutionary War than any other participant, regaining significant territories lost in earlier conflicts, without the massive costs sustained by France and the United States. As with the French treaty, however, some territories are returned to Britain. 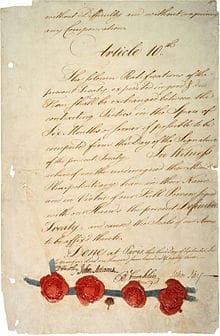 * first, Article 5, by giving back to Spain control of West Florida, in conjunction with existing control over Louisiana, also gave de facto control of the mouth of the Mississippi river, so the United States could not exercise the river navigation rights granted in its peace treaty to gain access from the Mississippi to the sea.